Faithful and colorful version of the Dickens classic has many well-sung Christmas carols but also an over-hearty Scrooge and a too bright lighting design. Five years ago Titan Theatre Company began in a Tex-Mex restaurant in Long Island City performing Shakespeare. Now they are performing a two-week run of a new version of Charles Dickens’ beloved A Christmas Carol at the Queens Theatre in Flushing Meadows Corona Park with a cast of 18. A semi-musical, their production includes many beautifully sung Christmas carols performed by the company throughout the well-paced evening. Titan has come a long way in a few years. Adapted by Emily Trask and Titan artistic director Lenny Banovez, the show begins with a grandfather reading Dickens’ book to his grandson in the present time. The lights change, and we are back in 1843 London where the Grandfather turns into miser Ebenezer Scrooge now dressed in one of Becky Willett’s many period-appropriate Victorian costumes. All of the famous scenes are depicted (the office visits by the Carolers, the invitation from Ebenezer’s nephew Fred, and the two businessmen looking for a charitable donation; Scrooge’s midnight visits from his late partner Joseph Marley, the Ghosts of Christmases Past, Present and Future and his tour of his life as the city sleeps; and his reformation by sending the Christmas goose to the poor family of his clerk Bob Cratchit, joining his nephew and friends at the their Christmas dinner, and becoming the savior of the sickly Tiny Tim.) As Jasmine Nicole’s scenery is on wheels, the cast is able to change the sets very quickly for this multi-scened play with music. While the use of 44 characters (with at least one actor playing as many as five roles) may make this show a bit difficult for the younger children to follow, the softening of the story suggests that the show is intended for family viewing. Kevin Loomis, who has appeared on Broadway in Spider-Man: Turn Off the Dark and Inherit the Wind, plays Scrooge as so hearty a character that he doesn’t have far to go to reform. We never get the feeling that he is as miserly or as stingy as he is described by the story. Even more evident is the extremely bright lighting by Alan Piotrowicz that leaves out the sinister nature of the story. Where Scrooge’s rooms at midnight with his tiny fire should be in deep shadows so that the ghosts take us by surprise, Piotrowicz has them flooded with lighting. While this makes the show less scary for young children, it also keeps this from being a true ghost story. Nevertheless, many of the other performances pick up the slack. 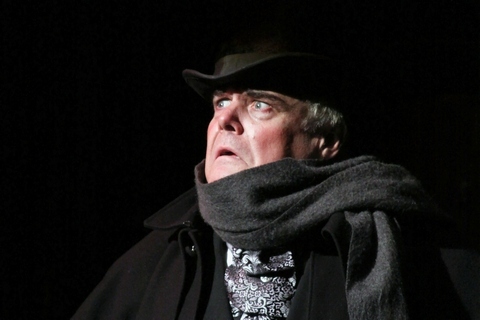 Particularly memorable are Michael Selkirk as the robust and genial Ghost of Christmas Present, Andy Baleschwiler as both a menacing Marley and an ominously silent Ghost of Christmas Future, and Wilmari Myburgh, amusing as Scrooge’s servant Mrs. Dilber. Selkirk and Myburgh also appear as the animated and jolly Fezziwigs who lead the dancing at their own Christmas party. Like the miserly Scrooge, John Taylor Phillips’ Bob Cratchit also appears much too healthy to be living on only 15 shillings a week for his very large family. Although the program lists four narrators, this new version at times stretches to as many as six more which is a bit confusing as the viewer finds oneself wondering who is this now. While some of the characterizations are rather bland, Banovez’ staging is particularly fine in its crowd scenes. Nicholas Sotack has created the historic dances, and Wiley Deweese is responsible for the music arrangements for the many carols as well as dance numbers. The recorded music is the work of sound designer Weston Wetzel. Although Titan Theatre Company has chosen not to make this Christmas Carol very spectral or scary, it has created a diverting evening with a great deal of holiday music. This is an entertainment the whole family can enjoy – as long as they are old enough to keep all the characters straight. There is also the contemporary relevance at this holiday season that not all people are equally fortunate. This imaginative spin-off of Charles Dickens’ "A Christmas Carol" is the story of a post-adolescent Tiny Tim as he embarks on a journey to discover himself. A delightful, very inventive musical adaptation of the classic tale created for family audiences, with a large vibrant cast, led by a terrific Scrooge. A haunting reminder of what death can bring out for those still living.